On January 24, President Donald Trump directed the Secretary of Commerce to develop a plan for the construction of American-made pipelines. This directive is an initial step in implementing the President’s promise that his trade policy would be based on two main principles: Buy America and Hire America. Those are the two arms of his newly created National Trade Council. The Buy America directive raises questions regarding the potential expansion of domestic content requirements. Trump’s Presidential Memorandum gives the Commerce Secretary six months to develop a plan “under which all new pipelines, as well as retrofitted, repaired, or expanded pipelines, inside the borders of the United States, including portions of pipelines, use materials and equipment produced in the United States”. In addition to adding the conditions that the Buy America requirement be applied “to the maximum extent possible and to the extent permitted by law”, the directive elaborates on what is meant by “produced in the United States”. The President specifies that all manufacturing processes for iron and steel products, from the initial melting stage through the application of coatings, must occur in the U.S. The made-in-America requirement will not be satisfied where steel or iron material or products are manufactured abroad from U.S. semi-finished steel or iron or manufactured in the U.S. from foreign semi-finished steel or iron. The U.S. already mandates the use of U.S.-made iron and steel and manufactured products in a variety of infrastructure projects. Existing Buy America requirements apply to public projects undertaken by governmental entities with federal funds. In particular, such requirements apply to transportation projects. In accordance with legislative requirements, the Department of Transportation imposes domestic content requirements on highway, railway and transit projects and airport expansions. Because Buy America requirements in public projects discriminate against foreign products, they are inconsistent with U.S. obligations under agreements that apply to government procurement. As a consequence, the U.S. excludes those requirements from its procurement commitments under the WTO Government Procurement Agreement and free trade agreements (FTAs). The President’s call for a plan for American-made pipelines does not appear to be limited to public projects funded by the federal government. Rather, it would appear to apply to private pipeline projects since most, if not all, pipelines are constructed by private entities. Is the President seeking a means of extending Buy America requirements to the private sector? If so, how would they be enforced? Will Congress be asked to enact legislation to mandate them? 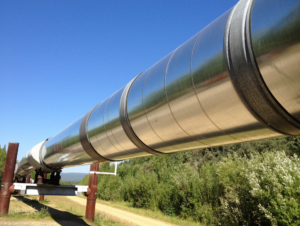 Will the Commerce plan provide for compliance with U.S. trade obligations under the WTO and FTAs in carrying out Buy America requirements for pipelines? On the same day that he issued his pipeline directive, the President issued memoranda that are aimed at advancing two private pipelines that had been stymied by the Obama Administration. The Keystone XL Pipeline memorandum to the Secretaries of State, Army and Interior invites TransCanada, the pipeline developer, to promptly re-submit its application to the Department of State for a Presidential permit for the construction and operation of the pipeline. It also directs the Department of State and other agencies to review such application expeditiously. The second Presidential memorandum to the Secretary of the Army aims to clear the way for the construction of the Dakota Access Pipeline. On December 4, 2016, the U.S. Army Corps of Engineers announced that it would not grant an easement for the pipeline under Lake Oahe and was undertaking an environmental impact statement to look at possible alternative routes. The Trump memorandum calls for expedited review and approval of federal permits and approvals relating to that pipeline. Are these pipeline projects the type of pipelines that would be required by the Trump Administration to use only American-made steel and iron products? The pipeline plan that the Commerce Department develops may provide an indication of how far the new Administration intends to extend Buy America requirements.